A lush Balinese-inspired masterpiece on 15 acres, Hale ‘Ae Kai™ is one of Kauai’s finest estates. With a private trail to Secret Beach, Hale ‘Ae Kai™ boasts astounding ocean views from its clifftop perch. 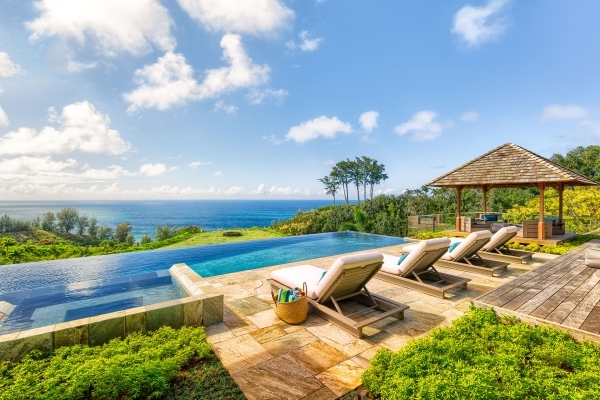 This working organic farm brims with tropical fruit trees and flowers, an infinity edge pool and spa, and views that stretch from Bali Hai to the Kilauea Lighthouse. 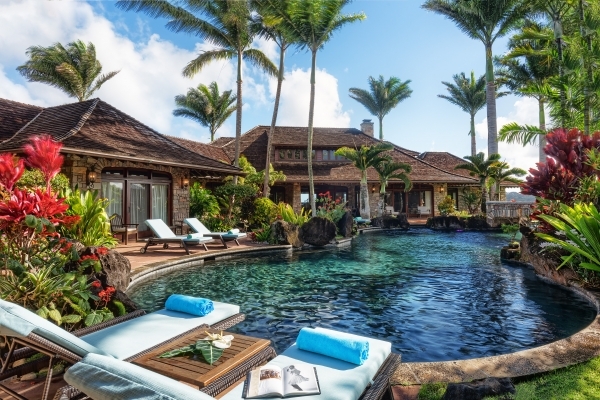 Truly one-of-a-kind, Hale ‘Ae Kai™ is a luxury compound comprised of four pavilions, surrounded by gardens and ponds and connected by breezeways and footbridges. It’s ideal for large groups who desire privacy. -Central Pavilion with expansive gourmet kitchen, dining area, living room, office, state-of-the-art media room, wet bar, full bath, plus one king-size bedroom with full bath. Fitness studio with Cybex Eagle equipment, Pilates reformer, and a ping pong table. -Master pavilion with king suite with more than 1,100 square feet, living area, wet bar, and spa bath with indoor/outdoor shower, dressing room, and walk-in closet. Three lanais, each with distinctive views of Kilauea Lighthouse or garden/pond. -Two guest suite pavilions, each with a king suite, spacious full bath, private indoor/outdoor shower, wet bar, and lanai. Beauty and modernity meet in this standout oceanfront home perched above Secret Beach. A grand estate centered on a magnificent lagoon-style saltwater pool with two waterfalls, a grotto, hot tub and bridge. Contact our on-island hosts to start planning your dream vacation.